This upholstered collection will be the signature showpiece of your home. 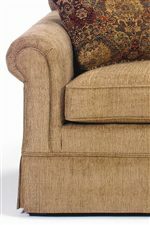 These upholstery collections are synonymous with quality construction, unmatched comfort and trendy styling. Choose from an extensive selection of custom fabrics, wood finishes and accent pillows. So take a seat, you'll be comforted knowing this stylish collection is the perfect one for you. Browse other items in the 4200 collection from AHFA in the area.